9085 Glacier Highway Suite 301, Juneau, Alaska 99801 Map It! Alaska Shirt Company - 100,000 shirts, a huge curio section and 6,000 feet of wall to wall value! Juneau Shirt Company is Alaska's #1 shopping destination! LOW PRICES EVERYDAY! Tram Plaza Building. Just across from the Docks. Foggy Mountain Shop - Kayaking, camping and mountain gear. Rugged clothing for cold, wet weather. Outfitting Alaskans since 1974. Patagonia, The North Face, Arc'teryx, Mountain Hardwear, Helly-Hansen clothing. Gregory, Lowe, Dana Design packs. Salomon, Merrell, Montrail boots. Invisible World Trading Co. - Specializing in wool, silk,alpaca and cashmere goods from South America and China since 1985. We design many of our items; you won't find them anywhere else. 369 S. Franklin St.
Annie Kaill's Fine Crafts Gallery - Distinctive pottery, jewelry, ornaments and Alaskan fine art. Gifts for all occasions. Delighting Juneau residents and visitors year round since 1975. Gastineau Guiding Company - Nature center and unique shop at the top of the Tram. Nature related gifts and books. learn about flora, fauna, hiking and enjoy fresh mountain air. Juneau's Imagination Station - An Alaskan toy store that lets your imagination run wild. Featuring Alaskan toys, games and dolls as well as fantastic playthings from around the world. 175 S. Franklin St. The Jade Shop - We are the Polar Jade mining Company. Largest selection of Jade in the U. S. Jade is Alaska's gemstone. Knowledgeable and friendly staff. 321 S. Franklin St.
Trove Shops, Juneau - Trove offers a distinct and personalized shopping experience through its diverse blend of clothing, accessories and jewelry. Drawing influence from multiple industries and modern lifestyle, we are excited to have created a store that complements your way of life. We strive to carry products that define who you are—unique, tasteful and timeless. Ivory Jacks - Beautiful and eco conscious fashion jewelry is designed by father & daughter duo, Kurt Tripp & Courtney Tripp and fashioned from prehistoric woolly mammoth ivory (Alaska's official State fossil), woolly mammoth tooth, and fossil walrus ivory from Alaska. Inovative & artistic sculpture hand made from indigenous Alaskan materials and ulus are created in Juneau by the multi talented artist, Chupak. Find Ivory Jacks jewelry & Chupak Sculpture at select boutiques in Juneau & throughout Alaska and at ivoryjack@ivoryjacks.com. Make sure to find Ivory Jacks on Facebook! The Jewel Box - Juneau's oldest jewelry store, featuring Rolex, Tissot, Lalique, rare gold quartz and natural gold nugget jewelry. Open year round for locals and visitors. 248 Front Street. Denali Dreams Soap Company - At Denali Dreams Soap Company, we offer distinctive all natural handcrafted soaps made in Alaska. 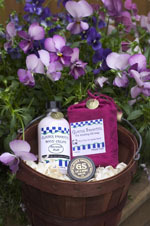 Our soaps are exceptionally mild with a rich lather. Herbs, spices, or natural pigments are added for texture and color. We hand cut and wrap each bar of soap. It is a delight for us to share with you one of life's little pleasures, a lovely handmade soap.......enjoy!